With new DPP’s on the verge of being released, the in form defender looks a sure thing to gain a new status. Playing the quarter back role, Daniel’s form is undeniable with scores of 98, 96 and 105 in his last three with the Dogs making him the go to guy out of the back line. He has a couple of nice games coming up against the Blues, Dockers and the Tigers which will cause his price to skyrocket given his BE of 67. He is nice and unique with 1 percent ownership and a perfect upgrade from Will Setterfield. Ownership increased from nine to 14 percent last week and Neale certainly rewarded his new coaches with 139. He is now averaging 140 in his last three and has a BE of just 83 leading into his game with the Pies. There is a slight concern Levi Greenwood will come back in to tag him and the Pies have also been surprisingly restrictive over the first month. Having said that, we have seen the ceiling that was missing the last couple of years at the Dockers and he has shot up the Rolling 22 rankings as a result. Is it time? Fantasy stud ZM started the season slowly following an injury interrupted pre season, dropping by $63,000, but there are signs that he is ready to return to the elite bracket. The Bombers seem to have snapped out of their funk and Merrett have a low of 95 in his last three, highlighted by 128 on the weekend. He has a low ownership of just 4% and a break even of 84. Is the best downgrade target of the week after a sensational debut with 25 touches and a score of 86. Despite being given the chance to play at the top level due to injury and suspension, his form through the VFL practice games and opening round was undeniable and he didn’t miss a beat transferring it. After a game like that, there are no job security issues and his BE is -11 so his price will increase nice and quick. It didn’t take Adams long to show what he is all about, pumping out a nice score of 116 from 28 possessions with an impressive eight tackles. He has a break even of 96, but it’s his low ownership of just 1% that may give you a leg up in your league or ranking. I hate chasing a unique for the sake of it but I had Adams firmly embedded in the rolling 22 before he was injured in the pre season. It was a nice start to the year, albeit, without Andrew Gaff. Before his teammate returned to the side, Sheed didn’t drop below triple figures with a high in round one of 133, but since coming back, Sheed has dropped off… And in a bad way on the weekend with a season low of 66 from just 17 possessions, a far cry from his season high of 38. 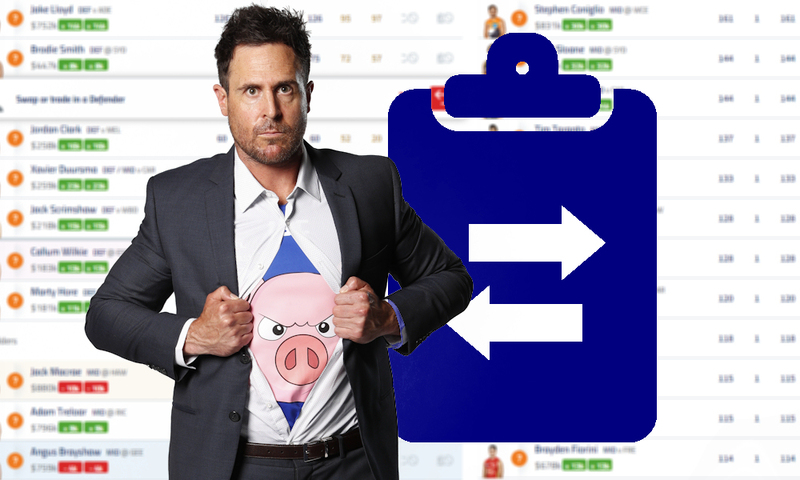 He still has a managble break even of 102, but bringing in a unique option like one of the players mentioned above or Marcus Bontempelli (MID, $766,000). At this stage my trades are Will Setterfield and Michael Gibbons to Jack Ross and Liam Baker in a small cash grab. Update following round three. Read last week’s by clicking here. Showed he can get it done in wins and losses. williams be of 66, clark 42. heeney 81 and newnes 57. so there’s literally no difference in the money. I reckon you should still give williams just one more chance, he should get over 66 so you wouldnt be losing any money. go clark to newnes. I’m waiting on the teams. I have to punt Setterfield, can’t rely upon Parker to cover him, and would like to get Ross in the midfield. My rookies haven’t made enough cash yet to launch a decent upgrade. I am completely stuck on what to do. i want to get rid of crisp after 2 sub 60s but other than that i dont know what to do. Any suggestions? Well I have less than 10k because of some big trades last week so that doesn’t really help. Parker to Lockhart and Setterfield to Heeney or Setterfield to Billings. Parker to Hore and Setterfield to Newnes? Great read Roy, would be handy to have the player prices and BE next to their names in the rolling 22 list if possible? Saves having to look them up and gives an easy visual comparison within the same position. Roy is employed by the AFL who offer the premium subscribers the BE scores so I doubt he will be putting them up. Id personally recommend the premium subscription, not much and supports the game that we love to play! BE’s are readily available for free on footywire, so no need to pay for a subscription. I was just asking for them to be pulled through to the list on this article for ease of reference. I hadn’t realised that sort of information would still have to be manually added in, I assumed it was basic data mapping that would pull it through along with the score and average that are being shown already. Sheed has to go, if you dont already have Libba would you save $200k and get him over Bont? Yep, Libba’s breakeven is still only 29. Take the cash grab and upgrade somewhere else. Defs : Whitfield, Lloyd, Newman, B smith, Duursma, Hore . (e) Clark, Burgess . Mids : Treloar, Rockliff ( oink city ), Coniglio, Brayshaw, B Crouch, Liberatore, Walsh, Constable . (e) Gibbons, Stack . Rucks : Gawn, Reilly. (e) Fort, Hunter . Forwards : Boak, Dangerfield, Billings, Worpel, Drew, Setterfield . (e) Balta, Parker . Franklin a genuine threat who has had a few difficult years and still made all Australian skipper last year .Replaces Drew who has beem affected by the return of Wines. Setterfield stays on bench do to structure and Parker gets a nod though only expecting a maximum score of 65 . Sorry, but it seems like a terrible idea to trade a guy (treloar) who is averaging 114 and hasn’t averaged less than 108 in the last 3 years, regardless of who you’re getting in (Bont). As for buddy…. its your team not mine, but the dude is averaging 65. He might get a 150 this season, but you’ll be lucky if he averages 90. I think there are other smokies who are a better choice due to pure ball gathering roles – newnes? marshall? caleb daniel? Thinking possibly going Clark to Hore and Setterfield to Newnes which leaves me $4k. I’m not sold on Newnes but it’s the best I can get to that way. Or should I go Williams to Hore and Setterfield to Heeney Thoughts on what trades to do? Don’t want to but need to upgrade Setters, no other decent options. Now heeney is under injury cloud who should I bring in. Have I missed the boat on Worpel? ?, at the moment, running with 2 Premos (Kelly, Danger) and 4 rookies (Petrucelle, Rozee, Drew, Parker/Setterfield) in forward line, unsure to go to Worpel (use Clark DPP Rozee, and butters to North) or Daniel (use Durrsma DPP Rozee, and butters to Ross) , obviously 50K difference between the,, but unsure if they will average the same at the end. Or do I stick with the 2 Premos and 4 rookies another week, use Setters and Butters to go down to Fwd Rookie and Ross/North depending on selection…hopefully get up to Heney or Billings next week, unfortunately I think I have missed the boat on Boak. Bigger average gain with the second, but Crisp is probably due for a score? Wanting to get rid of these, just not sure who to prioritise? 3. Caleb daniel and laird. I’ve gone Sheed to Ross if that helps, Clark still has a bit more to make and not sure on Hore’s js. Baker should be ok for now but Martin, Houli, Riewolt and Cotchin have to come back in over the next 2 weeks. Last week I Traded out Newnes so I could bring Liberatore into my side. This week I’m Trading out Settlefield and Rozee and bringing Newnes and Baker back into my side unless there is a 170k Forward playing then I’ll be bringing in Boak as I have 225K already in bank. Struggling for trades this week, I have a few options I am considering. Open to any and all feedback! 1. Trading Cogs to Libba freeing up cash for Williams to Whitfield next week. 2. Gibbons to Ross and Collins to Hore. My argument is Libba averages about the same and will increase in value, seems unthinkable to trade out a premium but is Kelly being back hurting Libba? My fwd and def are very weak. Do I try to boost them or chase the well priced/ in form mids or chase up and coming cash cows? Why do you have a 500k player on your mid bench! May as well cash sheed in for Ross and play Miles this week as they will likely score similar. Then upgrade Setters to Danger/Boak. Next week get him to a fantasy relevant player. Got 54k in the bank. Im unsure of what trades to perform this week. Ideally, want to get whitfield in the next couple weeks. Is it clarks time to depart, and if so for who? Or is it the most beneficial to fix the bench by going atkins > ross and parker > miers??? Who would you trade out of to get Libba?